I can't believe how long it's been since my last post! With a new job to adjust to, family events, and enjoying the gorgeous weather (one of the nicest, rain-free summers on record! ), blogging kind of took a back seat. I have a backlog of photos to edit and post and products to share with you, including Zoya Evvie, which was among the three polishes I picked up earlier this year during the "3 Free" sale. 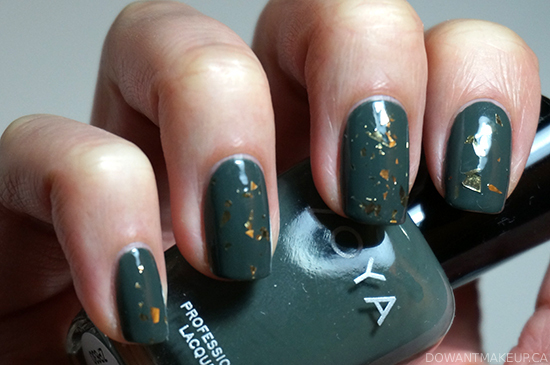 Zoya Evvie's smoky green-grey creme goodness would look perfectly at home on the fingertips of a skiier/snowboarder/socialite relaxing by the fire in a cozy Whistler chalet. It just looks really chic--no surprise, since it's a part of Zoya's NYFW Peter Som collection. I think it can come across a little more blue-green on cooler skin tones, but on me it's very much a green tone. It's 100% unique in my collection (unlike its sister, Zoya Ciara, ahem) and there doesn't seem to be a close dupe to it. What could make this effortlessly stylish shade even cooler? The answer is always glitter. In this case, American Apparel Meteor Shower. The shredded, uneven gold glitter adds a little extra edge to any mani and pairs particularly well with the green in Evvie. I received a lot of compliments on this combination and would definitely do it again. What's the first polish you'll reach for when Fall arrives? Recently, new Vancouver-based BookingNest got in touch with me about their services. Essentially, BookingNest helps make scheduling beauty and wellness appointments quicker and easier for both potential clients and businesses. With just a few clicks, I can find a new hairstylist to try, see their contact info and location on a map, check out pricing and reviews, and even book my appointment online. To get the word out about BookingNest, they hooked me up with one of their members for some TLC. 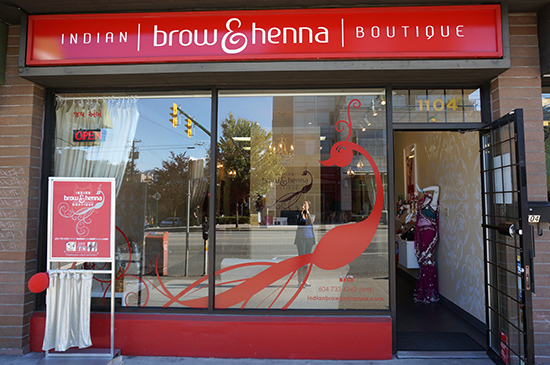 After hurrying out of my office post-meeting in downtown Vancouver, anxiously trying to figure out if I was waiting at the right bus stop (the bus stop sign turned out to have a different name for the bus), and riding a crowded bus at rush hour, I arrived at the doorstep of Indian Brow and Henna Boutique (1104 West Broadway, Vancouver) sweaty, haggard, and in desperate need of some relaxation. 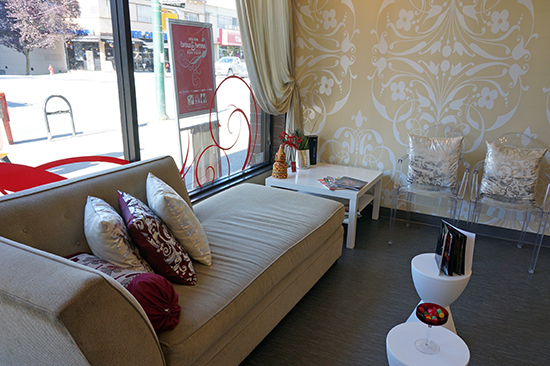 I felt better as soon as I stepped inside and took in the clean, modern decor and cozy waiting area. I was greeted warmly and offered a chai tea. I met the super-sweet Hema, who co-owns the boutique with her sister Rupal. We discussed what I was interested in getting done that day--brow threading, brow tinting, lash tinting, all of which were new to me. 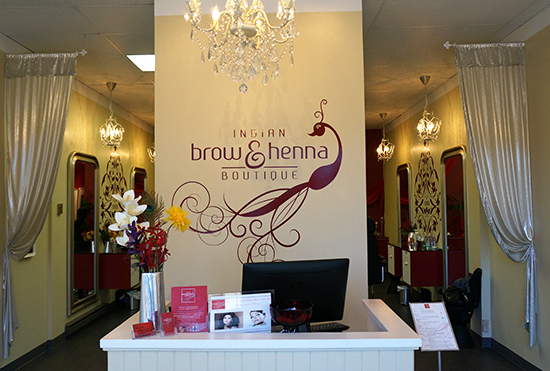 Throughout each service, Hema took care to explain what she was doing and checked frequently to make sure I was feeling comfortable, especially during the lash tinting and brow threading.